For most wine drinkers Italian wine means the ubiquitous Chianti and Pinot Grigio and they would struggle to find Piemonte/Piedmont on a map. I would certainly like a € for every time a UK friend has asked “how’s Tuscany?”. I can almost forgive them as the region is largely made up of small, family-owned and worked vineyards whose production levels are seldom sufficient to attract interest from the supermarkets. To put this in perspective, Piemonte has less than 10% of Italy’s total vines under cultivation, in a country that makes more wine than any other in the world (around 20%). Nonetheless the quality and variety is superb and its “terroir” is as beautiful as anywhere in the world. At the top of the pile are Barolo and Barbaresco, dubbed as the “King and Queen of wines”, and they can compete favourably with the very best that the Old World can offer i.e. France, Spain and of course Tuscany. Like classic Bordeaux and Burgundy they can prove almost eternal in terms of ageing. There are several exciting grape varieties that are only successfully grown in Piemonte and don’t adapt well to other terroirs and climates like some global varietals such as Cabernet Sauvignon and Syrah. This makes Piemonte unique. Nebbiolo is a late maturing grape (late September/early October) that produces light coloured tannic wines which generally need some years to reach their optimum. The 2 outstanding areas of production are the DOCG (Denominazione di origine controllata e garantita) areas of Barbaresco and Barolo. 100% Nebbiolo grape, grown on pre-defined, predominantly South-facing, slopes located South of Tanaro in the communes of Barbaresco, Neive, Treiso and San Rocco seno d’Elvio. 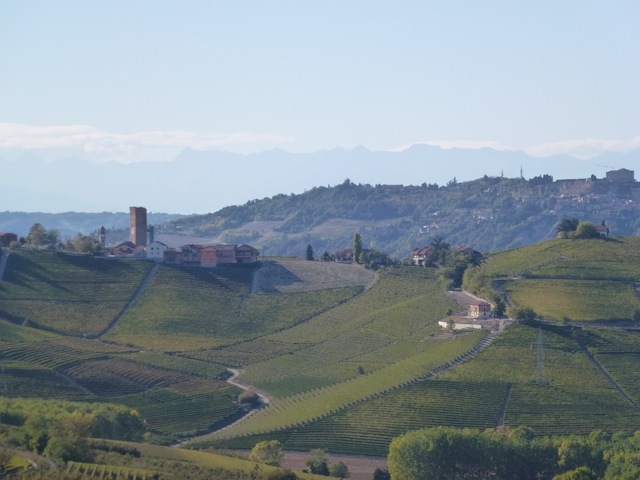 Neive has slightly higher vineyards that tend to produce more perfumed wines with firmer tannins, Barbaresco the fruitiest while Treiso wines are less tannic and earthier especially as you head south towards San Rocco. A slight maritime influence and lower elevation than Barolo means a slightly earlier harvest (from end of September) and softer tannins. 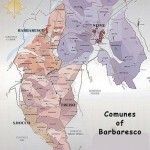 There are around 200 winemakers who can produce Barbaresco but production is around 1/3 that of Barolo. The regulations require a minimum of 12.5% alcohol and 21 months total ageing of which 9 months must in wood. Wines designated Riserva require 45 months ageing. In reality most Barbareschi have alcohol levels of 13.5% or more and spend a year or 2 in oak. Characteristic aromas and flavours are roses/violets, cherries and other red fruits and berries, liquorice and tar. Probably at their best 5 -10 years after the vintage. As well as the producers’ name and “Barbaresco” wines from a single designated slope will also show the name of that “cru” on the label. This particularly appealing as one can then identify the exact site where the grapes are grown. No more than 10 miles away you encounter the splendour of the hillside villages of Barolo. Like Barbaresco the wines are made exclusively from Nebbiolo and are subject to similar rules but everything is more. A minimum of 12 months in oak (in reality at least 2 years) and 3 years total ageing. The wines are usually offered in the 4th year following the vintage i.e. the 2008 will be available in 2012. Riservas require 57 months ageing. The vineyards are on average slightly higher in elevation and there are 4 times as many producers (c800). 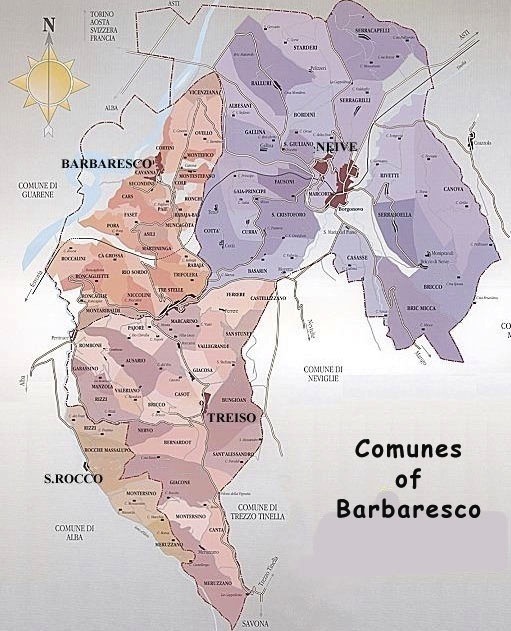 Generally Barolos have harsher young tannins and are more muscular and longer lived than their Barbaresco counterparts but Barbaresco tends to provide more elegance and consistency. 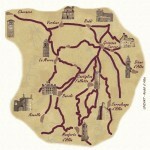 There are 11 villages that can make Barolo: Barolo itself, Castiglione Falleto, Serralunga d’Alba, Cherasco, Diano d’Alba, Grinzane Cavour, La Morra, Monforte d’Alba, Novello, Roddi, Verduno. Usually harvested in October. Like Barbaresco, wines wholly from a specific “cru” will show the name of the site on the label.